Are you interested in putting roof shingles on your home, but not sure where to start? 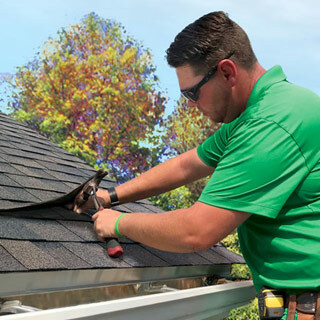 At PJ Fitzpatrick, we have a team of roofing professionals with the experience to help with any roof repair or roof replacement project, and we can talk with you about a no-obligation quote. But if you’re interested in roofing your own home, we’re happy to provide these helpful hints on how to install roof shingles. We hope they prove to be useful for you. Safety first: Use extreme caution while working on your roof. Be sure to use a safety harness or safety rails. Prepare your roof by tearing off the old layer of roof, if needed. How do you know? Most municipalities don’t allow more than 2 layers of roof, and it’s always a good idea to take the time to remove any old layers. Taking the time to do the tear off prolongs the lifespan of your new roof. When you remove the old roof, be sure to check for old rotting sections or any section that needs to be replaced and patch wherever needed. Then, remove the old shingles and take out as many of the old nails as possible. Sweep and clean the surface of your roof. You’ll want to add an aluminum drip edge at the bottom of each side, including the back and front. It helps with water flow and prevents water damage to your roof. Be sure to overhang a 1/2 inch space between the edge of your roof and the overhang of the drip edge. Your drip edge should be off your roof’s edge by 1/2 inch to allow room for the water flow to be away from the wood. Add your underlayment, roof felt or tar paper. The underlayment is crucial for you to have the proper fire rating, water protection and weather protection for your home. The roof felt helps to protect your roof and prevent water absorption by creating a layer between your roof and its shingles. After you’ve added the roof felt, add chalk lines to keep your shingles aligned. You want to install a starter row of shingles, called a course. Cut off and remove the edges of your starter shingle course and nail or staple it to the roof. Then, add each course of shingles and overlap them, row by row. Each shingle is 12 inches high and there’s a line that runs across the middle of each shingle about 5 to 6 inches down. That’s the overhang line. Your next shingle course should hang down to that line. You need to alternate each course of shingles to ensure the rows don’t end in the same place. That would cause a potentially weak spot in your shingles and your shingles might leak over time. As you install the second course, cut off the first tab, if it’s a three-tab shingle. Then on the third course, cut off the second tab and so on. You want to do the same thing if you’re installing architectural shingles by alternating the length of your first shingle on each course. At the top of the roof, you have to cover the top seam. Even if you are using architectural shingles, it’s suggested for the top edge that you use three-tab shingles. They are thinner and more pliable, which you need for going over the top seam. You’ll want to cut your shingles to 5 to 6 inches in width and overlap them over the roof’s top seam. Follow these steps for how to install roof shingles, and you’ll have a roof that should keep you warm and dry for up to 20 years. Remember that we have roofing experts at PJ Fitzpatrick who are ready to assist any time you need us.